The U.S. economic expansion continues, supported by a consumer that remains upbeat and a solid corporate-earnings backdrop. Second-quarter real GDP grew at a robust 4.1%, recording its best pace since 2014 and indicative of an economy firmly in expansionary territory. The overall employment picture remains strong. Both May and June witnessed employers adding over 200,000 new jobs. Despite strong payroll growth, the unemployment rate ticked up slightly from 3.8% to 4.0%, as more people entered the workforce in search of a job. Inflation remains contained for now, but tight labor conditions are suggesting this could change. The Labor Department’s employment-cost index rose 2.8% year-over-year in June, the strongest gain since September 2008. The manufacturing side of the economy also continues to perform well. The Institute for Supply Management’s Purchasing Managers Index fell slightly in July to 58.1 after a very strong reading in June, but continues to suggest a well-fueled manufacturing base. Affirming the ISM survey was the fact that 17 of the 18 manufacturing sectors reported growth in June. With over half of S&P 500 companies reporting so far, earnings have generally met or exceeded expectations, with notable exceptions for companies exposed to rising input costs largely associated with the advent of steel and aluminum tariffs. As trade tensions intensify, economists will be watching for evidence of a global slowdown. Domestic and foreign indices moved higher to end the month as investors were attracted to strong corporate earnings while largely ignoring deepening trade concerns. The DJIA and S&P 500 rose 4.8% and 3.7%, respectively, in large part due to strong industrial earnings. The NASDAQ climbed 2.2% to notch its fourth straight monthly gain. 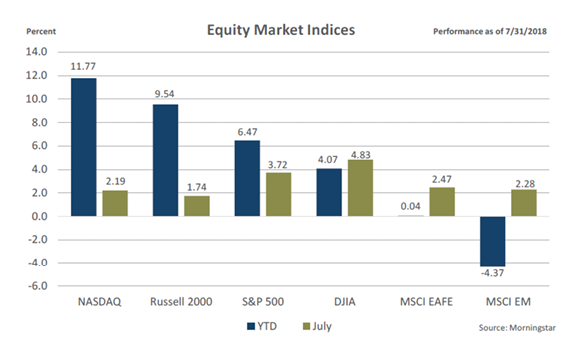 While “growth” stocks continue to dominate their “value” counterparts year-to-date, attraction to growth stocks slowed in the waning days of July. International and emerging markets also had positive gains in July with both the MSCI EAFE and EM indices up over 2%. Nevertheless, international stocks remain well behind their domestic counterparts given pockets of weakening economic growth and a strong-dollar headwind. Government bond rates increased slightly throughout the month, resulting in a bond market that has been generally unable to pull itself into positive territory and reverse year-to -date losses. The yield on the 10-year Treasury closed the month at 2.96%, up from 2.85% at the end of June. 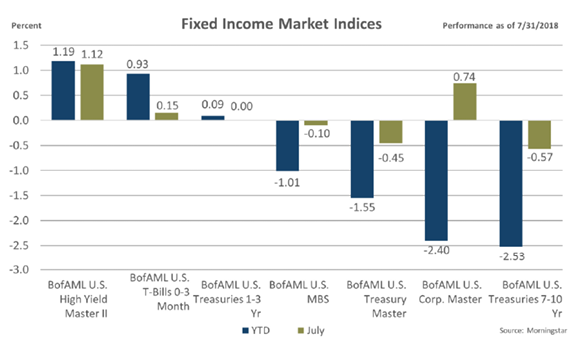 Corporate bond spreads markedly narrowed in July, resulting in both high-yield and investment-grade corporate bonds significantly outpacing their government counterparts. The Federal Reserve held its target rate steady at 1.75%-2.00% at its most recent meeting. The committee is widely expected to implement two more rate increases in 2018, especially given the robustness of recent economic data points.